The Angau Memorial Hospital now has a new operating theater and a 20 bed ward which was funded by the Australian Government and officially declared open by Australian High Commissioner to Papua New Guinea his Excellency Mr Bruce Davis. 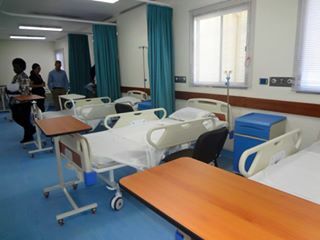 The new operating theater is fully equipped with antistatic and suction machines and monitors with a patient recovery area, patient and staff ablution facilities, a nurses station and sterilization rooms. The 20 bed ward is also fitted with patient beds, bedside tables, visitor chairs, patient toilet shower facilities and amenities for staff. “This is an investment of over K4 million by the Australian Government that will increase the capacity of ANGAU Hospital to treat patients” said the Australian High Commissioner Mr Bruce Davies. He further added that the ward and the theater are part of the first phase of the Australian government’s commitment in redeveloping ANGAU which is focused on rehabilitating surgical facilities and improving quality and inpatient accommodation. Also present at the opening was Secretary for Health; Mr Pasco Kase who acknowledged the Australian government for funding the facilities and pleased to see the developments taking place at ANGAU further adding that the new facilities will be of great benefit to the hospital and most importantly for the patients. CEO of ANGAU, Dr Christopher Kenyhercz while thanking the Australian government said, the opening of these facilities will not only improve the services but motivate and inspire the staff to work smart.